Renovating a house didn’t bankrupt me. Wedding and a honeymoon didn’t bankrupt me. Buying a (used) car - it did. Well, only because I bought a car in the most expensive place in the world. 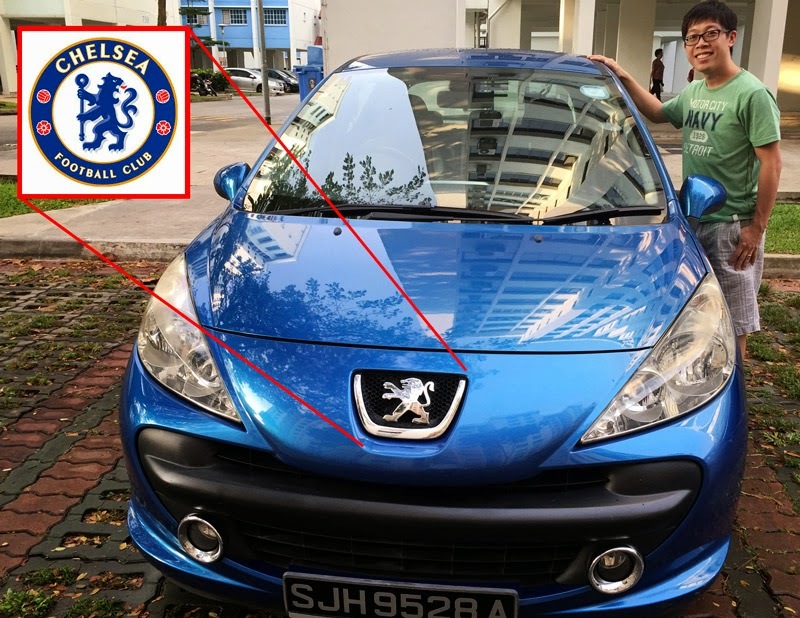 For $36,000, I got a Peugeot 207, which has 3 years 8 months lifespan left. This post is about how I buy a used car without going through the blood-sucking-car-dealers. When you buy a car, a very important cost is the depreciation value because that is the value that the car will lose every year. There are many formula relating to depreciation alone. In short, if you drive the car till the end of its 10 years lifespan, than you will get back 50% of the OMV. You can check a car OMV from LTA website (requires car license number plate). My Peugeot 207 has an OMV of $20,000, therefore I can get back $10,000. That means, my Peugeot 207 actually costs me $7,200 a year. Road tax and car insurance are 2 other major cost components. A better car will have to fork up more. As a reference, my car is 1598cc, therefore road tax is $742 a year. I bought car insurance from Direct Asia (apparently the cheapest) and it cost $1,800 a year. My cost of owning a car a year = $7200 + $742 + $1800 = nearly $10,000 a year! Let’s exclude petrol and parking for now.. I took half a day to shop in Automobile Megamart, visiting numerous shops to ask for a good value, low depreciation car. At the end of the day, I decided to buy a car directly, simply because dealers/agents pricing is way too high. The difference is that it has 11 months shorter lifespan than mine, yet it cost even more ($39,900 vs $36,000)! 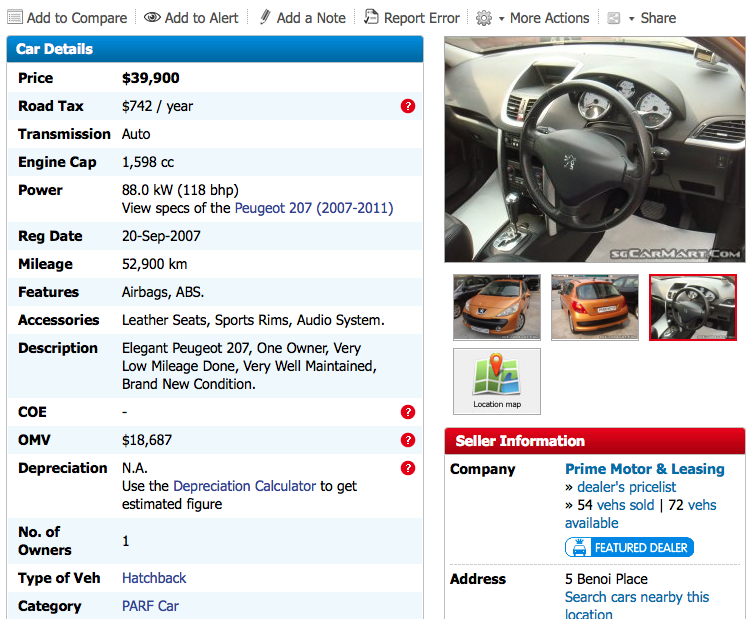 If you click on the depreciation calculator, it says the car depreciation is $11,000. Mine is $7,200, which is 34% lesser! To be fair, (some) car dealers do provide a value in their service - eg. touch up of the car, warranty for a few months, and more cars to choose from. But it’s not worthwhile in my opinion. A new car has similar depreciation of $10,000. If you have the cash to pay for a new car, you might as well buy a new car. Your only risk is that the market could go south..
Buying a car directly from a car owner isn’t hard. sgcarmart does list ads from direct owner. They even provide a good guide with steps of how to buy/sell used car directly. That’s it. It could be handover in as fast as 1 day.